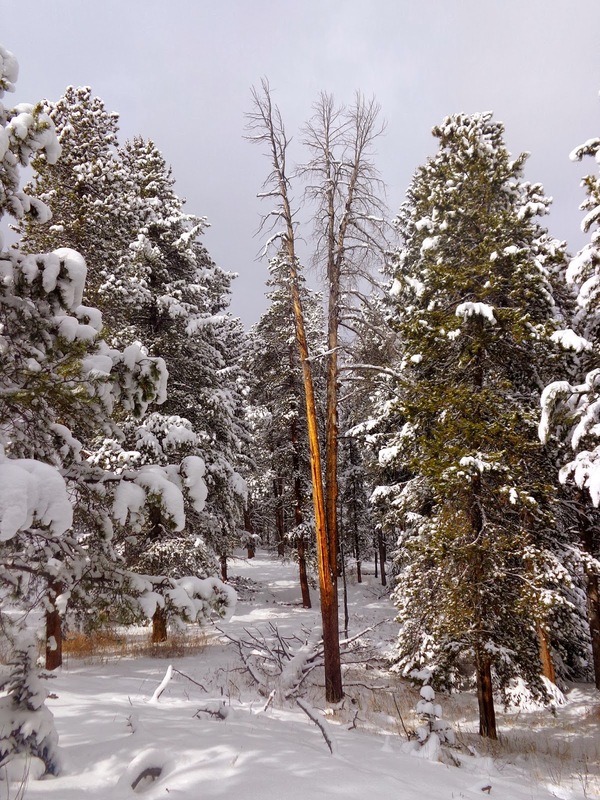 With a solid, multi-day snowfall blanketing the Denver region, some of the close-by Jeffco and Denver Mountain parks take on a new dimension of interest. I decided to check out Meyer Ranch Park for the first time -- very popular in winter, due to its north-facing aspect right off of Hwy 285, where kids of all ages enjoy sledding. But the winter history of Meyer Ranch goes back for decades, as an old rope-tow was used pre-WWII when the area was known as "Mt. Lugo." So, this lost ski-area held promise for good snow, and it delivered. Several smaller loops circle groves of aspen and pine on the lower parts of the hill, eventually zig-zagging upward to the "Old Ski Run Trail." These gentle but steady loops provide a decent ski workout and fun glide down, but end several hundred feet below the summit of Legault Mountain. A light bushwhack can finish this up. In winter, with powdery snow overlaying rock and downed trees, some sort of flotation can be helpful. So I brought my wife's snowshoes with me. This was my first time with snowshoes on my feet in Colorado, and second time ever I think. Normally I'll do anything I can to figure out ways not to use snowshoes, by running or skiing instead, but it actually worked out pretty well. And gave me good practice for an upcoming race that uses them. On a clear day, the summit rock is easily visible through the trees upon reaching the saddle at the far edge of the Old Ski Trail loop. A sign with an arrow pointing to the trail is located at a good spot to leave the trail to the east -- to the south is a cattle crossing and private property sign. It looked like there was a climber's trail along the way, but otherwise it was a short, fun trek up. 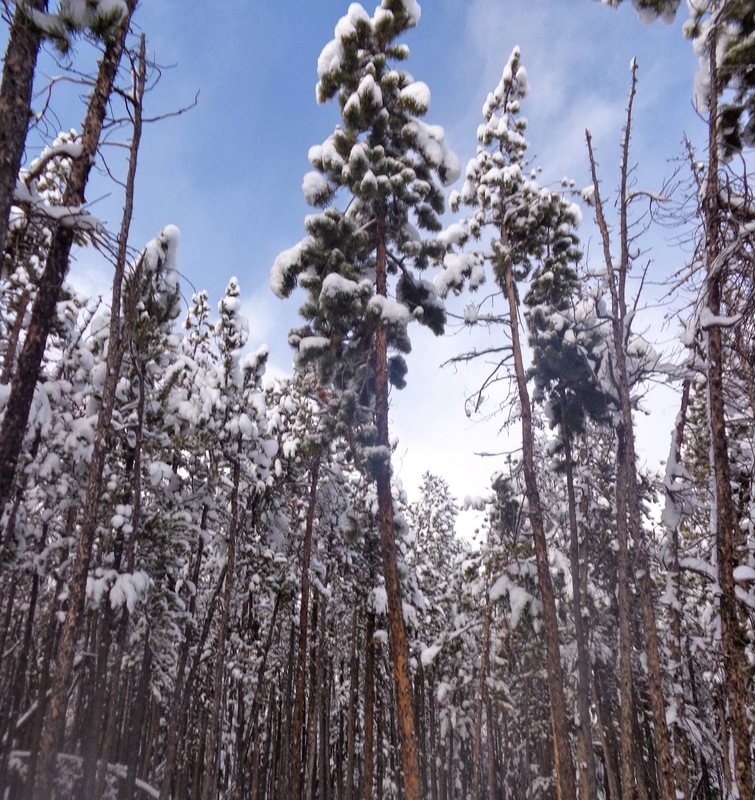 The snow was powdery enough, and the woods opened up for short periods of time, to be able to run a bit on the snowshoes. Not bad. But I was happy to get back to my skis for more speed on less effort. The occasional visible rock or two slows down the flow in a few spots, but otherwise it's a great glide. It might even be an enjoyable snowshoe the whole way. With several (4-5) inches of new snow on the ground in Golden, J and I looked for a quick, accessible ski with a shorter drive. Having snow in town means it's a great time to check out new, nearby options. Ironically, for all of the great trails in the Golden area, many of them are too rocky, steep, narrow, and/or windblown to be considered excellent skiing (I've tried to force the issue for some OK rock-skiing). But, just a couple thousand feet higher are some fantastic options, and I-70 can be avoided. 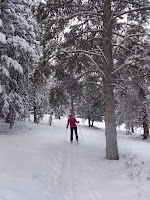 We decided to go South on 285, and drove past Meyer Ranch Park, which itself is a popular sledding hill and would be a good but steeper option for skiing and snowshoeing, in favour of Flying J Ranch Park. Although it looks straightforward on the map, it was a bit tricky to figure out how to get from 285 to Barkley Road and then 73 toward Evergreen (there isn't good signage right off of 285)...but everyone else in the world uses GPS so you'll probably figure it out just fine. The road into the park had tire tracks but wasn't plowed, so luckily there was a balance of great new snow that wasn't too much for the ground clearance of my Civic. Momentum was our friend as we made it up the hill into the lot that was replete with SUVs and trucks. There's only one signed trail in the park: a 3 mile loop. We were immediately surrounded by newly-frosted trees and fantastic snow, great for gliding, with some previous tracks and snowshoes. 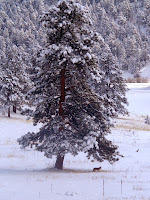 We watched a coyote bound across a field, before posing underneath a large pine. 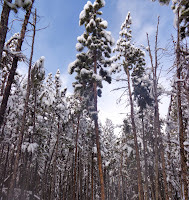 And pine trees were the rest of the story, including tight, narrow trails through lodgepole forest, as well as big, thick conifers that I didn't see as much in the northern part of the state, because 8000+ feet was usually found only on slanted, diagonal terrain in or near canyons. Near the end of our counterclockwise loop, we took a short detour up (rightside of the trail) into a sunny meadow, where we made a quick extra loop before heading back down. 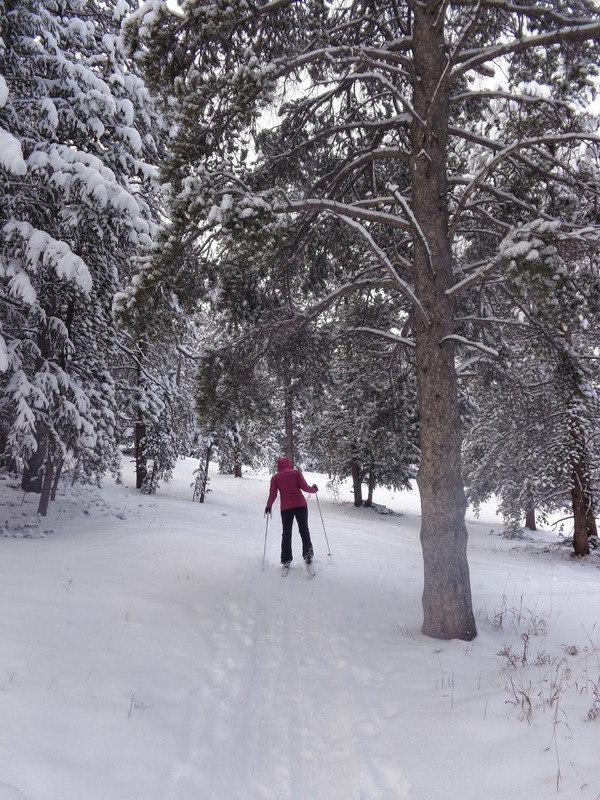 We only skied about 80 minutes total, but it was nice to be in the woods to enjoy the snow after a pleasant and quick drive. With more time, it would have been just as fun to do a second loop. Going clockwise puts most of the climbing in the beginning, with a more fun descent in tight trees right in the middle; counterclockwise rolls, with a moderate descent saved for the very end. It's a bit short for a single-loop run or hike, but is pretty fun on skis. Or, apparently, fatbikes as well. Peru Creek Road is a popular ski and snowshoe tour, with minimal gain, a wide path, and great views. 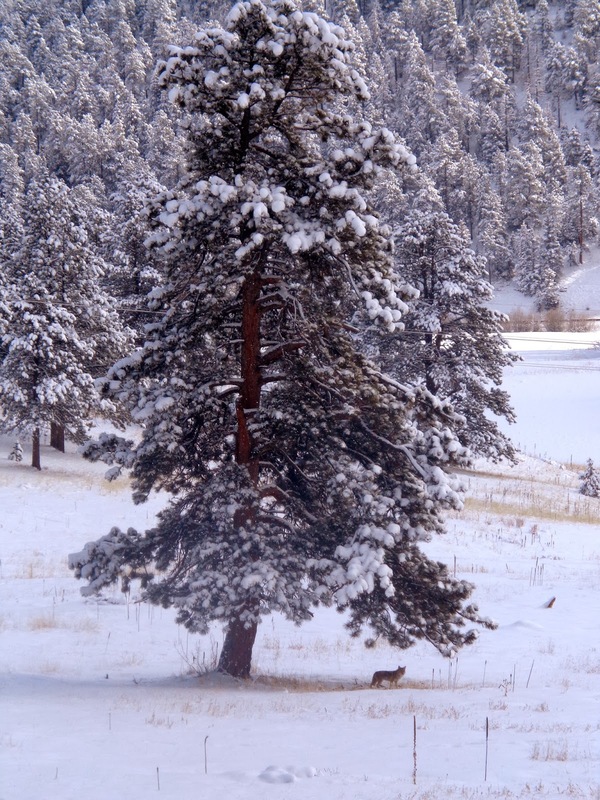 Located between Keystone and Montezuma, we had a chance to check it out last month. The road was packed smooth with snow, and has interesting mine remnants just after the first mile. Some of our views were obscured by clouds and heavy winds up high, although the trail itself is nicely sheltered from wind. After nearly 3 miles, staying straight on a few previous junctions, we reached an open, windy, and swampy area covered in deep snow. Close to our halfway-mileage goal anyway, and not wanting to break more trail, we turned around. On the way back, we saw several other parties -- a mixture of skiers and snowshoers -- but it wasn't overly crowded and there was plenty of room for all. We decided to take a short tour up in Chihauhau Gulch, which I knew ultimately led toward Gray's Peak, where it had a higher avalanche risk above treeline, but we just decided to poke around a bit. It didn't hurt that someone had recently broken trail, and the sun was now shining. This short addition was worthy and recommended, as it passed directly through aspen groves, and quickly (after a stream crossing) provided superb views. And deep powder! We met the couple that had just broken trail and decided not to go further, and we all had a short but satisfying glide back to Peru Creek Road, made better by a tighter trail through the aspens. In the final mile, I coaxed J into trying another option, of a trail that forked to the left on the return. My map (heavily "zoomed out" to show several counties) and the topography suggested that it was a parallel trail that would bring us back near our car, as we were paralleling the creek, so we gave it a go. Of course, the trail (actually a dirt road called "Webster Street" on the map) kept climbing slightly but steadily, as Peru Creek dropped farther and farther below us. "Let's just see where this ends up" won out slightly over "Maybe we should turn around now," but it was a great trail that again put us into aspen groves. We began to see buildings, and it became evident that we were on our way to the town of Montezuma itself, which was secretly something I wanted to check out anyway, so it worked out. After passing some mining/construction equipment, there was a neat little shelter on the side of the trail. And then we were in Montezuma, which was pretty much just a collection of houses and buildings. This left us about 3/4 mile past our parking spot. I asked J if she wanted to ski, or if I should go get the car; and then the couple we met earlier went by in their truck (he drove down just to check out Montezuma quickly!) and offered us a ride, which would have been easy and quick in the back of the truck. But J was content to finish up our tour on the edge of the road. Despite finding myself doing it several times per season, I rarely see evidence of anyone else chopping across roadside ditch slop, so I was quite pleased that my wife was willing to do so! What a gal. In short, Peru Creek is certainly an easy suggestion for winter touring, while some side options lead to scenic aspen groves and nicer downhills. If Montezuma is on the agenda for some reason, or if you're staying there, Webster St./2nd Street is a more fun option when going from Montezuma back down to Peru Creek.